Let all guests that come be received like Christ Himself, for He will say: “I was a stranger and ye took Me in.” And let fitting honour be shewn to all, especially to such as are of the household of the faith, and to strangers. When, therefore, a guest is announced, let him be met by the Superior or the brethren, with all due charity. Let them first pray together, and thus associate with one another in peace; but the kiss of peace must not be offered until after prayer, on account of the delusions of the devil. In this salutation let all humility be shewn. At the arrival or departure of all guests, let Christ – who indeed is received in their persons – be adored in them, by bowing the head or even prostrating on the ground. Our woods not void of hospitality. With friendly step precedes his unknown guest. For Saint Benedict, those who knock at the door of the monastery are sent by Christ. They are emissaries of the Lord Christ, our true King. In welcoming the emissaries of the King, it is the King Himself who is welcomed; and in opening the doors to Christ, the monastery is sanctified by the presence of the Father and of the Holy Ghost. Saint Benedict concerns himself with the most pragmatic and homely details of hospitality; he does this because, in the light of faith, he sees hospitality as a kind of sacrament. 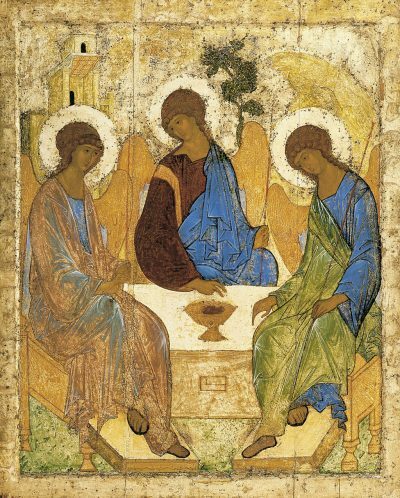 It is characteristically Benedictine to find the mystic (that is, hidden divine things) in what is homely: in the humble realities of hearth and table; of clean water for tired feet and worn hands; in crisp white bedsheets, pillows, and warm blankets; in food and drink that is well–prepared and artfully presented. The guestmaster’s preparation of a guest room is no less important than the sacristan’s preparation of the altar. Blessed Schuster speaks of the medieval practice of abbot and monks going out in procession with thurible and processional cross to meet the approaching guests. The ceremony of welcome is, in effect, liturgical because the whole event is sacramental. Saint Benedict presents a ritual order of welcome. First, the abbot and brethren go out, with all due charity, to meet the newly arrived guest or guests. The Gospels illumine this anticipation of the guest. The father of the prodigal son goes out to meet him while his son is yet on the road leading to the house: “And when he was yet a great way off, his father saw him, and was moved with compassion, and running to him fell upon his neck, and kissed him.” (Luke 15:20). The wise virgins go out to meet the Bridegroom while is yet on the way: “And at midnight there was a cry made: Behold the bridegroom cometh, go ye forth to meet him” (Matthew 25:6). Martha, the sister of Lazarus, goes out to meet the Lord who arrives at Bethany after her brother’s death: “Martha therefore, as soon as she heard that Jesus was come, went to meet him” (John 11:20). Saint Benedict prescribes a liturgical gesture of adoration for the welcoming and departure of guests: the monks present are to bow or, even, to prostrate themselves on the ground. “Let Christ”, says Saint Benedict, “who indeed is received in their persons, be adored in them”. For Saint Benedict, the arrival of guests is a theological moment: an opportunity to recognise the presence of Christ and to adore Him. “For where there are two or three gathered together in my name, there am I in the midst of them” (Matthew 18:20). Nowhere does the secular gesture of shaking hands enter into the Benedictine ritual of welcome. In every detail of life, Saint Benedict would have his sons, “seek the things that are above; where Christ is sitting at the right hand of God” (Colossians 3:1). Here, Saint Benedict’s liturgical model emerges clearly. In the welcoming of guests, as in Holy Mass, the hearing of the Word of God precedes the offering of the Holy Sacrifice and the Holy Communion. In practice, this reading of the Word of God to guests takes place in three ways: at the Divine Office, in the refectory, and in spiritual conferences or colloquies with the guestmaster. It is never omitted, for the man who comes to the monastery is always, albeit unconsciously, asking for the Word of God. On one or two occasions we have welcomed guests who indicated their disinclination to participate in the Divine Office and Holy Mass. The guestmaster, in as winsome a way possible, encourages such guests to participate in the monastery’s prayer. Prayer is what a monastic community has to offer. All the other commodities of hospitality can be found elsewhere. The monastic guesthouse is not a Bed and Breakfast establishment, nor is it a kind of hostel for tourists. The secularisation of a monastic guesthouse, or its operation as a business, is never a good sign. It suggests that the monastic community itself has lost sight of its single purpose. The words of Our Lord at Bethany can, in certain situations, be applied to whole communities: “Martha, Martha, thou art careful, and art troubled about many things: But one thing is necessary. Mary hath chosen the best part, which shall not be taken away from her” (Luke 10:41–42). The ceremonial of welcome culminates in the abbot washing the hands of the guest and in a meal. Saint Benedict considers that the washing of the feet of guests is integral to the rites of welcome. While we practice the washing of the hands of guests at the entrance to the refectory, the washing of the feet has come to be associated with the welcoming of men into the noviceship. More often than not, the journey to the monastery has been long and arduous. The man who knocks at the door of the cloister arrives with bruised and soiled feet. The postulant must be made to feel welcome and offered a sacramental expression of the refreshment promised by Christ. Finally, guests are brought to the table. This is the culminating point of the Benedictine rites of hospitality. The abbot does not merely look on while the guests partake of what is set before them. He, or a monk designated by him, shares the meal with the guests and, in so doing, makes it a sign of communion that, effectively, points to the Most Holy Eucharist, the Sacrament of Unity. Benedictine hospitality has a Eucharistic finality.